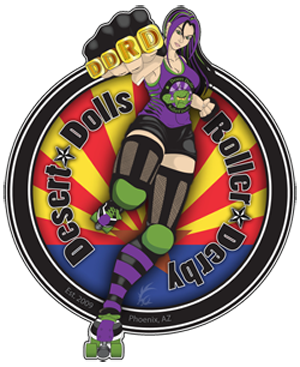 Established in 2009, Desert Dolls Roller Derby is one of the newest leagues to hit Arizona. Desert Dolls Roller Derby is the brainchild of 5 extraordinary women who after years of skating in other leagues decided to take their skills and dedication to create their own league, which sets itself apart from all others. With our commitment to being an all-inclusive and community oriented league, we believe that any woman, no matter her physical prowess, can be a derby girl. More than 85% of our girls have never skated before. But through ongoing mentoring from our DDRD founders and senior players, these women have blossomed into seasoned skaters. Desert Dolls Roller Derby strives to be community oriented by getting out and doing fundraisers and charity bouts to raise awareness concerning issues affecting the Valley. Our most recent charity bout boasted attendance well over 600, proving that our fans are as loyal to the league as the players are. What started out as a small group of friends has grown into a league of over 100 strong, independent women all with the same goal in mind: to provide family-friendly entertainment through one of the fastest growing sports in the country.